More friends and a blog: Strawberry jam. Here is the first batch of canning this year....strawberry jam. I don't usually make canned strawberry jam, I normally just make a small batch of freezer jam with dried pineapple as the sweetener, it is easy and delicious. However, this year my boys (all three of them) convinced me that they should have canned strawberry jam too. It does make sense, as I have a good size cold room with lots of shelves for preserves and only two freezers, to do as much preserving as possible that doesn't need to be frozen. 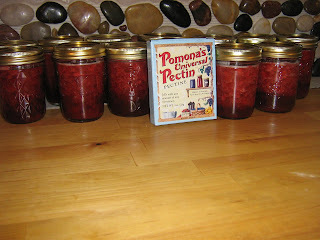 Thankfully I found Pomona's Pectin a few years ago and can enjoy making regular jam again. This batch used 12 cups of mashed strawberries and only 2 1/4 cup organic cane sugar - I could have used honey, juice concentrate, stevia or other sweeteners with this pectin too - so I feel that this is an acceptable amount of sweetener to me, most jam recipes call for almost the same amount of sugar as fruit. Using Pomona's allows the taste of the ripe, delicious fruit to shine through. Oh, but it didn't have enough of Ewan - so sad! And yes, those strawberries were really good.